So, why choose to carry your baby? Some would say convenience - by wearing your baby, you free your hands to accomplish your tasks. Babywearing enables you to nurse on the go, chase your active toddler around the park, run errands, or prepare dinner - all the things that still need to get done after the new baby arrives. Baby carriers quite simply allow you to remain active and get around places you wouldn't be able to otherwise - crowded malls, cobbled streets, airports, museums or castles - the list is endless and there is no need to compromise when you have the option of using a baby carrier. Convenience is a big factor but the benefits of babywearing extend much further, babies have a fundamental need for physical contact with their parents and caregivers. Babies who are worn sleep better, cry less, nurse and gain weight better, and tend to be more alert and interact with the world around them. Kangaroo care, holding a premature baby skin-to-skin, has been proven to promote physical growth and neurological development in tiny babies. By holding them close, parents bond with their babies and help them adapt to the world around them. But one of the most rewarding aspects of babywearing reaches far beyond the convenience and physical benefits, it's the absolute joy of holding your baby close, the intimacy if offers and that feeling of endless love! Happy & Secure - baby is happy, secure, calm and content and that makes for a happier mum and dad. You'll be seeing the same sites and will naturally talk to your baby about what you're both seeing, and he will respond to you and 'talk' back. If your baby is startled by something, he'll be comforted by your closeness and more ready to accept new faces and places. 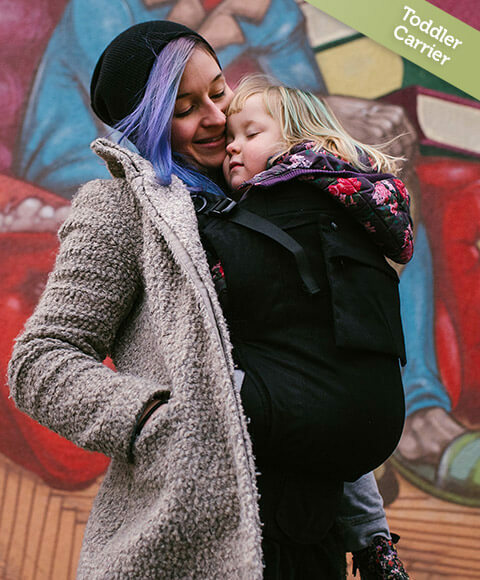 Useful & Effective - babywearing makes your daily life much easier. You can you can get on with all the things you need to do - play with your older children, pop to the shops, prepare dinner and still keep your baby close to you. You'll feel more confident and less tied down, while you baby feels comfortable, secure and warm. Great For Breastfeeding - many carriers offer a private and nurturing environment for nursing, and you are immediately able to respond to baby's hunger cues, so he doesn't need to get stressed or upset. If your baby likes to have long feeds, babywearing prevents you having to spend long periods of time stuck on the sofa. Eases Discomfort - if your baby suffers from reflux, colic or wind after feeding, holding them in an upright positions eases discomfort and makes it easier for the gas to pass through their bodies, and reduces possetting. Convenient - more convenient and much easier to get in and out of the car and manoeuvre around than a stroller or car seat. A baby wrap or carrier folds up to easily fit in your nappy bag, and it can be thrown in the washing machine when dirty. 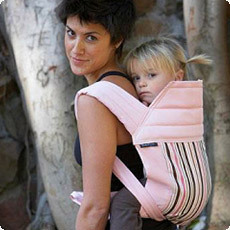 You are also much more mobile and can carry even heavy toddlers in comfort and style. Sometimes, the most difficult part of making a decision is knowing what questions to ask, but with so much to choose from, even then you can be spoilt for choice. SO, to help you along the way, we have a few suggestions, followed by some helpful questions to ask yourself. Remember, learning to use a baby carrier or wrap always takes a little bit of patience, so don't be afraid to try something new if it appears to meet all your needs, just think of it as another new parenting skill to master - probably one of the easier ones! Multiple Users (different shapes/sizes), breastfeeding a consideration, multiple carrying positions, from birth to pre-school - either a woven wrap or mei tai carrier, although a Stretch Wrap such as the Moby Wrap is an excellent choice for a newborn, with a competitive price point and clear instructions on how to wrap for the first time. Multiple Users (different shapes/sizes), front, back & often hip positions, from birth to pre-school, breastfeeding not essential - again, a woven wrap or mei tai carrier but in addition, a soft buckle carrier such as the Beco Baby Carrier or Manduca which divides your child's weight between your hips and shoulders, and holds them close. Hip/Cradle Carriers - (1) Ring Sling/Adjustable Pouch; multiple users, suitable from birth, excellent for breastfeeding or (2) Pouch; sized to fit wearer, suitable from birth, excellent compliment to other carriers or (3) Scootababy; multiple users, suitable from 4-5 months to pre-school, everyday essential and voted as one of the 'Top 3 Carriers, Mother & Baby Awards 2009'. Do you hope to breastfeed your baby in their carrier? It is possible to breastfeed in the majority of carriers, although some take a little more skill than others or alternatively, do not offer you maximum privacy. You should not feel you need to nurse discretely, but once your baby reaches 4-5 months, you will sometimes need to hide the world from her so she can focus on the task at hand. Recommendation: Stretch/Woven Wrap or Ring Sling; a nursing shawl can also be used with Pouches or Buckle/Mei Tai Carriers. Do you plan to share your carrier with the family? Some carriers are highly adjustable, while others are made to fit one size well. Unless you are all roughly the same height/weight, you'll need to consider an adjustable carrier. Recommendation: Buckle or Mei Tai Carrier, Stretch/Woven Wrap or Ring Sling. How long to you intend to carry your baby? Most carriers are designed to carry your child comfortably for many months or even years, dependent on their weight and how used you are to carrying. Birth to Pre-School: Woven Wrap, Buckle (some 4 months) or Mei Tai Carrier / Birth onward: all of the above, plus Stretch Wrap, Ring Sling & Pouch / 4-5 months onward: all of the above, plus Scootababy Hip Carrier. One of the most flexible options to cover all bases is a wrap carrier, but Buckle/Mei Tai Carriers are sometimes preferred by parents or carers who are new to carrying or intend to share their carrier with other family members. How/when do you plan to use your carrier? If you are looking for a carrier to use for many months/years, day-to-day, for walks in the country and around town, then a two-shoulder carrier would be the best option. 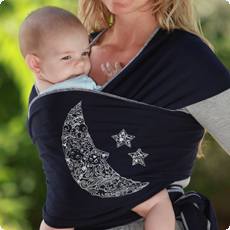 Recommendation: Woven Wrap, Buckle or Mei Tai Carrier (stretch wraps are ideal for younger children). If however, you are just looking for a quick 'grab-and-go' sling for short walks or shopping trips, then a handy hip carrier is always a consideration. Recommendations: Ring Sling/Adjustable Pouch or Scootababy (multiple users) or Pouch/Double Pouch such as the Baby K-Tan (sized to fit wearer). Do you hope to do housework while wearing your baby? Slings and carriers exist so that you can get things done, but some things just cannot be touched by curious little hands! If you could be cooking, vacuuming or making the bed, then a wraparound style in back carry position, or buckle/mei tai carrier would be the best options. Your baby will be more secure against your body in an upright position, out of harms way. Do you want a compact sling? A sling can be a very handy accessory to carry a weary toddler and especially useful to replace your buggy on quick trips between the car and the supermarket. One of the most compact carriers is a pouch or alternatively, a lightweight gauze wrap. Both fold up neatly to fit in your handbag, coat pocket or car door. How many uses do you need your carrier to fulfil? More specialised, structured carriers such as the Mei Tai, Buckle or Hip Carriers fulfil a specific purpose as front, back and/or hip carriers, which is where you pay for the convenience and expertise of designs that fulfil your family's needs for many years. The less structured designs, due to their simplicity, offer additional uses - lightweight wraparound, picnic blanket or fun tent, and become softer and more snugly with long-term use. Do you want to impress your friends with your skills? 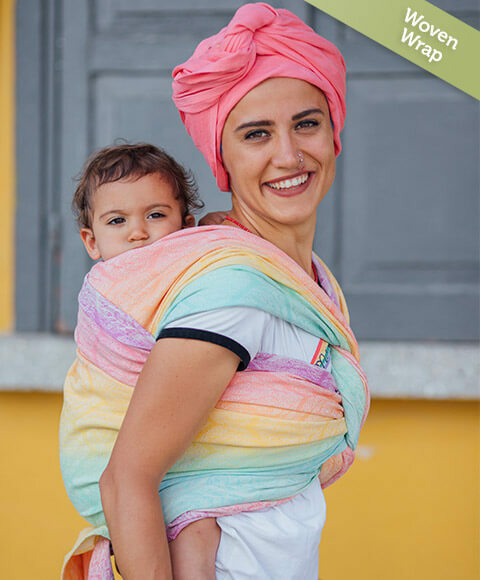 A wraparound carrier is the way to go - soft, stretch carriers such as the Moby Wrap are an excellent introduction to mastering the skills of a wrap and surprisingly easy to use, although impressive to an observer! 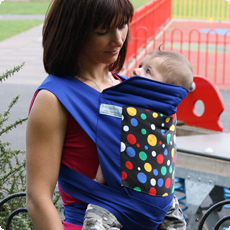 This can also be the start of a long-term affair with one of the most traditional methods of carrying our children, incredibly comfortable for the wearer and extremely impressive to their friends. If you would like to discuss anything you have read in further detail, please don't hesitate to contact us by e-mail: info@slumber-roo.co.uk or telephone 01803 859034. Customers often ask: "What are the benefits of using a baby wrap or similar, over the everyday options available in many high street stores?" 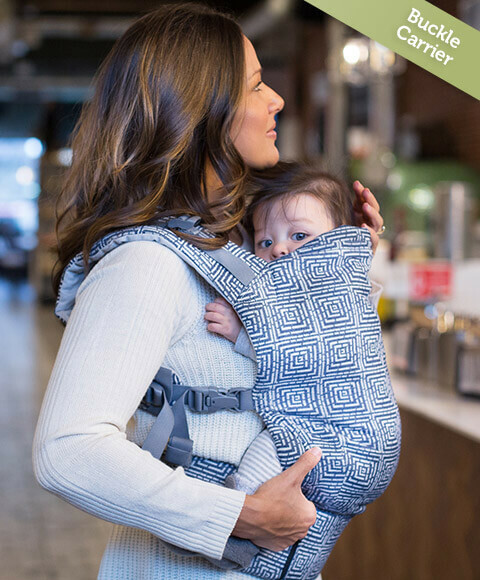 The answer is quite simple, the traditional carriers (wraparound carriers & mei tai), coupled with updated designs such as pouch, ring sling and soft buckle carriers, all encourage you to carry your child in an ergonomically correct position. Research suggests that upright baby carriers which spread a baby's legs wide are preferable to ones where the baby is supported only around the crotch with their weight centred directly above their pelvis. A natural wide legged, seated position where your baby's bottom and thighs are supported is optimal for the development of their pelvis. The carrier should also hold your baby close against your body and offer a newborn support along the length of their spine and behind their head. An older child (6 months upwards) should have support ideally up to their armpits. We have listed below the different styles of carrier and benefits associated with each design. In addition, we have compiled a style comparison table to help you choose which carrier is most suitable for you and your baby. Click headings to see content. When people think 'baby sling' they often think 'ring sling', one of the most useful tools in baby wearing - great for cradling a newborn or offering a tired toddler a handy hip carry, they are quick to use, compact to carry, and incredibly elegant! A ring sling is a single piece of fabric which threads through two rings to form a pouch to carry your baby. Worn over one shoulder like a sash, a baby sling with rings is adjustable to accommodate different sized baby wearers. The excess tail can be used for discreet nursing, sun protection for your baby or simply to show off the stunning design. If you prefer a more streamline look, simply wrap the fabric around the rings and tuck inside the sling, also a great look for dad. Most pouches are made to fit the wearer and can only be minimally adjusted folding the top layer of fabric out and down on the shoulder to tighten the fit, although some are adjustable with poppers or straps, such as the Hotsling Adjustable. A pouch is a single piece of fabric sewn together at the ends and then folded in on itself lengthways to form a pocket/pouch for your baby to be carried in - cradle, hip or front facing. You simply loop it over your head and one shoulder, pop your baby in and you're good to go! Pouches are sleek, simple and affordable; they fold up compactly and are a great accessory for your car or handbag. A wraparound carrier is the most basic of all baby carriers - a single piece of fabric which is wrapped around and tied in such a way that the baby is held securely against the wearers' body. This deceptively simple, unstructured carrier is perhaps the most versatile of all, offering numerous ways to carry a baby on the wearers' front, back or hip. Although it can take a little practice and dedication to master all of the possible carrying positions, it really is quite easy to master some of the more basic and extremely useful front carry positions used to carry younger babies. There are two main sub-categories of wraparound carriers: Stretch Wraps such as the Moby Wrap which are made of soft cotton and feel like your favourite t-shirt only better, with your precious bundle wrapped securely inside! Stretch Wraps are one of the best options for comfortably wearing a newborn for long periods, and for discrete nursing. Woven and Gauze Wraps are less stretchy but more supportive, offering superior back support to the wearer and providing comfortable wearing for larger babies and toddlers. They come in many different lengths dependent on the size of the wearer and variety of carrying positions you hope to master. The learning curve is higher than other carriers, but they are worth the investment in money and time if you're looking for the ultimate carrier in terms of comfort and versatility. NB: Slumber-Roo will not be selling woven or gauze wraps until Summer 2010. In the meantime, if you are interested in trying one, refer to our Hire Shop or telephone 01803 859034 for our top 3 vendor referrals. Recommended Woven Brands: Didymos, Storchenwiege and Hoppediz (plus many others). A mei tai is essentially a large rectangle of fabric with long straps coming off the corners, which you use to tie your baby to your body. Made out of sturdy and supportive fabric, these Asian-inspired designs are incredibly stylish, extremely comfortable and an excellent choice to carry a child from birth through to pre-school on either the wearer's front, back or hip. A spin-off of the Asian Mei Tai design, soft structured buckle carriers such as the Beco Butterfly 2, Babyhawk Oh Snap, Manduca and Patapum, have inevitably evolved into more mainstream friendly designs which are quick and easy to use, and offer excellent support for baby and long-term comfort for the wearer. Structured like a backpack, with two well-padded shoulder straps and a wide padded waist belt that distributes weight between the wearers' shoulders and hips, they are adjustable to accommodate a wide range of body sizes and for many, a familiar and reassuring design. They can be worn on the front or back, and some even offer a hip position such as the Manduca but if you're looking for a dedicated hip carrier, then the Scootababy provides the quick pop-ability of a one-shoulder carrier with the weight-transferring comfort of the soft structured buckle carriers. 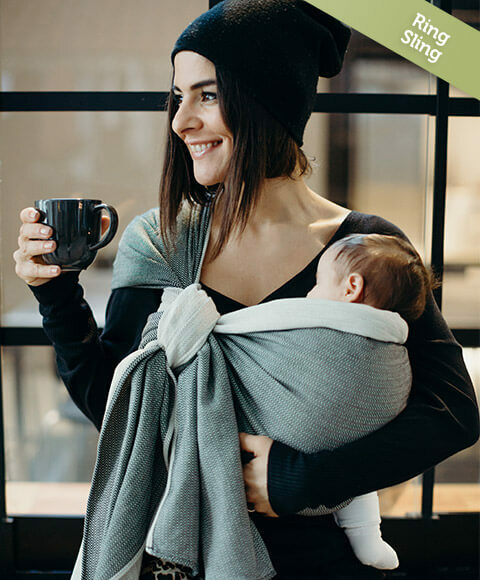 These are mostly simplified wrap designs which are either double-pouches and designed to fit the wearer such as the Baby K-Tan or alternatively, a wrap/ring sling design such as the Close Baby Carrier which is fully adjustable and suitable for a variety of wearers. 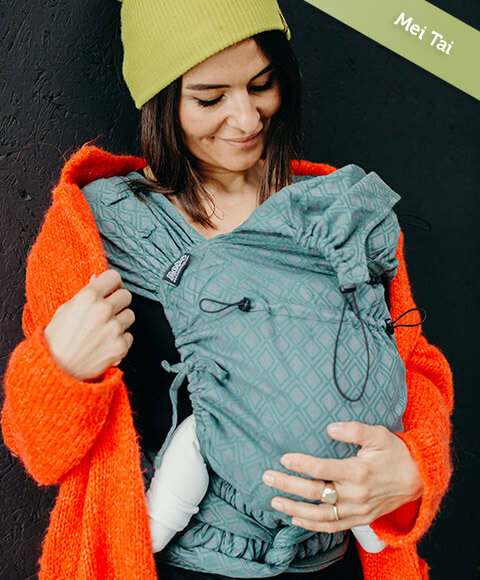 All of the carriers Slumber-Roo sell are stylish, comfortable and safe, but it's the two shouldered carriers that really shine when it comes to carrying a heavier baby for longer periods of time. That said we must not forget how useful the pouch and ring sling carriers can be for cradling a young baby or offering a "hip carry" to a weary toddler. They are very quick to use and you'll love the interaction they offer. 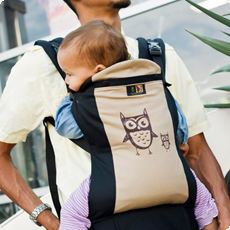 A well constructed hip carrier such as the Scootababy can for many families be one of their most used day-to-day accessories. The key to comfort in all styles of carrier is holding your child close to your body and above your centre of gravity (high and snug). You want to avoid having them "dangle" from your body or shoulders, or seated below your hip bone. Not only is this uncomfortable for the wearer, but it could comprise the security of your child. For a newborn a stretchy wrap such as the Moby Wrap is an excellent choice for day-to-day wear, offering you the option to breastfeed conveniently and keep your baby warm and secure. It takes about 15 minutes to master the technique of tying, and you can pop your baby in-and-out without the need to untie (just tighten slightly). 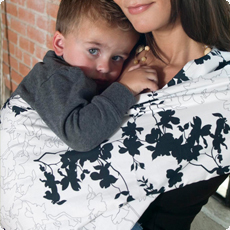 For a child of any age (birth to pre-school) one of the most comfortable carriers, for wearer and child, is a woven wrap. Woven Wraps can be tied and worn in numerous ways, offering a variety of carrying positions including front, back and hip. They are supportive and versatile, and an excellent choice for pregnant wearers. NB: Slumber-Roo will be introducing a variety of woven wraps to our online shop for Spring/Summer 2010. In the meantime, we would highly recommend Bebe Cannelle as an excellent retailer offering a good choice of products and excellent guidance. Mei Tai carriers are also incredibly comfortable, and very easy to use for both front and back carry positions. They offer the additional option of a hip carry, although it takes just a little practice to master the technique. Here at Slumber-Roo we sell a wide range of mei tai carriers including the very popular Babyhawk and NEW Babyhawk Oh Snap! Soft Buckle Carriers are based on the ancient design of the mei tai and again, are easy to master, very comfortable and can be used by multiple wearers. The main difference between the mei tai and buckle carriers is the quick-clip buckle mechanism (which some parents prefer) but in addition, the structured waist belt. The waist belt is often wider/firmer and helps transfer some of the child's weight to the wearers hips and as a direct result, makes many buckle carriers versatile to use with children from birth to pre-school (3 years+); the Beco Baby Carrier being an excellent example. The one shoulder sling material (pouch or ring sling) should rest on the ball (bone) of your shoulder not next to your neck. Moving the fabric toward your neck will allow more/maximum arm movement, but put strain on your muscles and possibly cause neck pain. This also applies to the soft buckle Scootababy carrier - the soft fleece strap should 'cup' your shoulder but as the material is flexible, should not restrict movement too much. Wrap Carriers distribute the weight evenly throughout the carrier but again, you should ensure the material 'cups' your shoulders and is evenly spread, rather than lying next to your neck. Soft Buckle and Mei Tai Carriers have padded straps that are designed to go over your shoulders. As these carriers are designed to spread the weight between your shoulders and hips/waist belt keeping your baby snug and close, you should find the position of the straps comfortable and natural (very easy to use). Your baby should rest at or above your belly button. Holding your little one lower than your waist will strain your back and cause you to get tired much faster; this is incredibly important for all positions including the hip carry. Hold your baby as close to your body as possible. The carrier or wrap/sling should "hold/strap your baby against your body" more than it "hangs baby from your shoulders." In a reclining position, ensure that baby's entire back and head is well supported by the fabric of the sling or wrap (almost like a hammock with fabric either side or the fabric nestled around them, keeping them cosy). In a seated position, there should be a wide band of fabric supporting the baby's thighs and buttocks not just a thin strip of fabric at the crotch. Their back should also be well supported with the fabric either behind their neck/head (newborns) or neatly under their shoulder blades/high on their back (bigger babies/toddlers). Please do not hesitate to telephone 01803 859034 or e-mail: customerservice@slumber-roo.co.uk if we can be of further assistance.